A first-time author, Debbie tells the inspiring tale of Crash and his sidekick and trainer, Trouble. 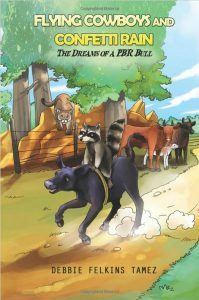 This is a team of bull and racoon, who will delight children on Crash’s quest to fulfill his dreams – to become Bull of the Year. He began as Walter, somewhat underwhelming. Deep within the thicket rested the still-tiny black newborn calf, which Beverly and High Roller, her mate who was also the leader of the herd, had named Walter. As Walter lay, his brown eyes lined with long thick lashes opened. He flicked his tiny ears as a lightning bug joined him. His mother gently nuzzled him, urging him to stand up. Each time he tried to stand, his wobbly legs went all the wrong directions, each one going its separate ways. But he grew up to become Rocket Man, and quite impressive. Soon several more calves joined Walter and his two friends. The green grassy creek bottom was covered with calves. All of them jumping, kicking and spinning as high and as fast as they could. Walter soon realized he could jump higher than any of the other calves in the herd. He was so proud of himself. “Rocket Man! That’s it! That’s my new name,” he thought. “Mom, from now on call me Rocket Man,” he yelled, running to tell the other calves. One day, he assumed a new name: Scene of the Crash. But he called himself just “Crash” for short. The chute gate swung open. Crash jumped high in the air. All four hooves were as high as a bullfighters hat! When his front feet hit the ground, he kicked high with his back legs. He felt Sean Willingham slip a little to the left side of his back so he began to spin fast to the right. Faster and faster he spun. Sean moved back to the center of his back and matched him jump for jump. Crash spun faster and faster but Sean stuck to him like glue. When the buzzer sounded, Sean unwrapped his rope and jumped off. The crowd was cheering so loud it almost hurt Crash’s ears. He stopped in the arena to look at all of the people. They were all cheering so loudly Crash could not hear the score but the confetti showered down on him. For a dash of celebrity sparkle, Debbie brings real-life professional bull riders (PBRs) into the story. You’ll want to put on some Garth Brooks while reading this kidlit wonder. Debbie is herself a bare-back bull rider, so she knows what she is talking about. 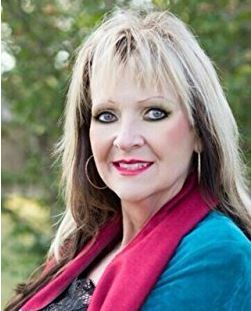 She is also a rodeo rider and a race horse rider, bringing plenty of personal inspiration to this charming story that she originally wrote for her oldest grandchild. Debbie came to us because she had the story developed, well-honed after telling it so many times. This is her first book, and she wanted to make sure it had the polish that you, the reader, would expect. We fell in love with the tale as soon as we read it. You can pick up your copy of the children’s book Flying Cowboys and Confetti Rain: Dreams of a PBR Bull at Amazon. Thanks for the kind acknowledgement of THGM’s services in the book, Debbie. The “Team” was mostly Kristin.